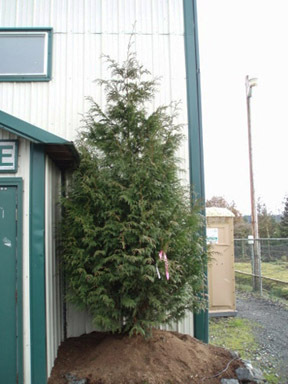 SEATTLE, WA: Big Trees Inc., (http://bigtreesupply.com/) a tree nursery and tree installation company in the Seattle area, recently assisted residents by installing new trees to act as a privacy screen on their property. The residents, a couple in the Issaquah Highlands, found themselves confronted with a new development being built right next to their property, a development project which would have meant much less trees and much less privacy. Big Trees Inc. was able to help the couple gain back the privacy screen by bringing in new trees. The development project on the couple’s southeast property line was taking out the single house and heavily wooded area which had been there, and turning it into a lot with multiple houses. The couple knew the houses would come soon, and didn’t have time to wait to plant small trees which would eventually grow. The couple called Big Trees Inc. and decided on bringing in a number of 22’ Excelsa Cedars to go on the side of the property facing the new development. The trees are scheduled for installation shortly, in time for them to be planted before the new homes arrive.